Walking up to VDT’s offices and studio in Brighton, you are immediately aware of the hubbub of attentive office staff, talented collaborators, and Charlotte’s welcoming exuberance. We have booked out an interview on a grey wintery afternoon in the New England Quarter and happily oblige Charlotte’s offer of a jam donut and cup of tea as we sit down to chat and talk through her most recent work, the Art of Attachment. Vincent Dance Theatre is a unique dance company that brings together critical performances imbued in social justice. Charlotte Vincent is the artistic director and lead choreographer of VDT with over twenty years’ experience of creating powerful dance productions that provide a combination of sophisticated choreography, social commentary, and participant community-led development. In 2018, Vincent Dance Company collaborated with Brighton Oasis Project (BOP), an organisation supporting women and children with substance misuse in the family, to bring to life the multi-faceted creative engagements of the Art of Attachment. The Art of Attachment project was an inclusive arts project led by the Brighton substance misuse charity, that sought to creatively express the impact of substance misuse on the lives of the women who participated, and their relations with their children, friends, partners; the way they make attachments with the world in general. The participants of the project had the opportunity to be part of workshops creating their own poems with acclaimed poet Lemn Sissay MBE; whilst the artistic direction of Charlotte and VDT was the very backbone of the project. 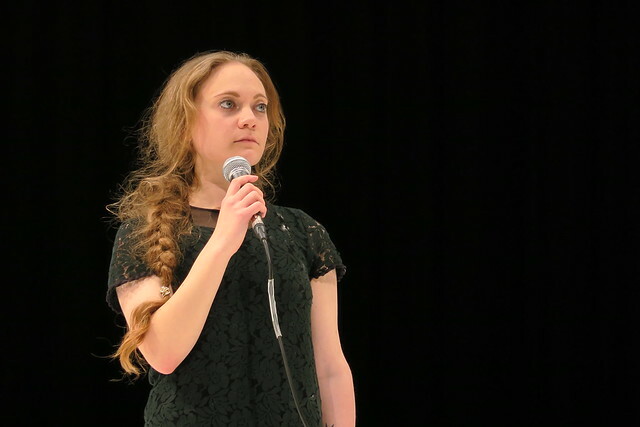 Over nine months, Charlotte led and guided women service users of BOP to first speak and then dance their truths, culminating in a powerful performance portraying the trauma of addiction through choreographing their own narratives, at the Attenborough Centre for Creative Arts (ACCA) in October 2018. I sat down with Charlotte to hear her take on working on the project, with the young women and their families, and her role in working as feminist maker concerned with social justice, with some thoughts on art in law sprinkled in for good measure. As an artist, I make critical performances that seek to comment on and expose current political, social and cultural concerns, and how they effect and affect those people and things that are far too often disempowered and ignored. Would you say you are in some sense an art therapist? I can see that there is a social justice element to a lot of the productions that you make, how important is it to capture a political question in what you do? For me the work I produce and envisage is often driven by gender politics – as a feminist maker. For too long the female experience has been unacknowledged on stage and on film and the experience of what it is to be a woman has been invisible, and still remains so. In a sense, I seek to make things visible, create the space for them to be seen, and this does not have to be about women – it can concern any sector of society that is oppressed, excluded and unseen. My production ‘SHUTDOWN’ in 2017/18 was actually about broken and misplaced masculinities, reflecting on what it is to be male today in the UK, so my work as a feminist maker extends not just to female accounts but beyond this to see how dance and my role as a mentor and choreographer can relate to contemporary issues affecting all of us. The most recent project you worked on was the Art of Attachment with Brighton Oasis Project. Tell me about this and the experience of working with women and families with substance misuse histories? The work involved in Art of Attachment has been very rewarding, albeit intense and very challenging. Throughout the nine months that I worked with the women, there was the continuous need for safeguarding to ensure that their road to recovery was protected as much as possible as we worked. As an artist and maker I was holding the space so that those participating could trust in me as a person and trust the process that is unfolding as much as possible. I think this project worked well but it did take its emotional toll on everyone involved. How did you find trying to tell their stories? I have never translated peoples’ specific stories on to the stage as directly as I have done with the Art of Attachment performance and the approach I took with this process. It was a long term project that required building a real and authentic rapport with the women over time. And the women are incredible, you only need to see the recordings of the performance to see how brave and courageous each of them have been to capture their disturbing and very sad, very violent narratives on stage. They do not need me to speak for them, they have spoken for themselves, with their own voices, in ways that they would not have imagined to be able to do until they started collaborating with me to create the performance. We spent a long time to start with sitting down, as if in a group therapy setting, the floor being a safe space, before the women felt able to finally stand up, move around and connect with their bodies. To be seen, to be vulnerable, can be excruciating, given past and ongoing histories of abuse, neglect and trauma. To be doing all of this without the substances that they were trying to avoid as was a real challenge. At times there were relapses and slips, but the preparations for the show and the choreographing of what they were sharing offered a focus away from the negative aspects of their lives and these remained outside the studio space. With the help of BOP therapeutic and operational staff, the women were monitored and supported throughout, those who did not continue and those who went on until the final performance all showed tenacity and resilience that perhaps they had forgotten they had, or even had not had the chance to celebrate before. So the role of the safeguarding is pretty key then in the kind of work that you do? Yes, it was key and multi-layered from VDT implementing our own very full Safeguarding Policy at all times, to using BOP’s ‘Check in and Check Out’ process to start and end sessions, to being clear about routes of support for the women once outside my studio. There were tensions between the creative ‘risk taking’ – to be bold, honest and authentic, to own and perform difficult material – and the need to keep the women safe on a practical level which we monitored and responded to daily throughout the project. There were issues around using real identities, people showing up at the live performance they may not have wanted to see, having safe spaces, adapting the process to accommodate mental health issues, panic attacks, disabilities in the room etc. so that the women felt fully supported during the time that they were with us in the studio and in the theatre. They did remarkably well – moving, writing, speaking their truths. We were careful to address how the women could be supported after the performance event in front of 300 people where they shared sensitive material – whilst they had been really focused for the nine months BOP and VDT staff were concerned that there would be the inevitable post-adrenaline / emotional crash afterwards, and the effect this would have on their recovery, or at least path to recovery. Recovery in this sense, is when someone has given up their drug of choice for some time, and some women were still in and out of using, which obviously made them much more vulnerable to relapsing again. We sought to mitigate this, working with BOP, to continue support and care for the women with creative sessions after the performance, and a filming schedule and screening of the live work on video to ease them out of a very challenging process. Some organises extra counselling to see them through the transition and three started Yoga together to continue their physical practice. One started volunteering at Oasis and Pavillions Drug & Alcohol Services, which capitalised on the strength they had gathered from the project back into the environment from which the work came. So yes, safeguarding and the therapeutic process had to constantly balanced with the risk-taking aspects of the creative practice. At times my role as Artistic Director would require stretching the boundaries of what the women felt they were able to do. There is a therapeutic aspect to the work VDT do already, and the strict procedures and structures we have in place to protect any participant, dancer or collaborator. In this work we also ‘disguised’ who owned stories when necessary – shared them amongst six performers so that anonymity could be maintained when needed. What was the performance like and what was unique about the Art of Attachment in terms of the creative process, that you enjoyed the most? The very first scene in the performance is of birth and trauma, the entering of a baby into the world and its removal from the mother. This places attachment centre stage immediately. 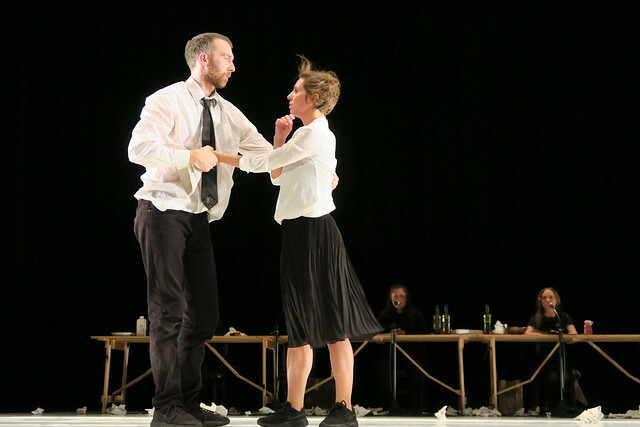 The performance then consisted of a series of duets between Robert Clark and Antonia Grove, as professional performers who physicalised aspects of the work – violent exchanges, birth, abuse, love- whilst the women sat protected by a long table that at times represented authority, a kitchen, a panel boardroom, a court, a school and also gave them a space behind which they could sit and feel safe . The table represented the many interview settings they had been in, having to explain themselves, the many formal settings they had to prepare themselves for with social workers etc. At times in this work, they were in charge of the interview, they were behind the desk. At times, they also took charge of the space, stepping forward into the downstage arena to perform their own stories, duets and narratives. I think for me, the uniqueness is obviously the indelible role of the women, their presence, their words within the work at times translated by the professionals, at others performed by themselves – it was very moving. There was a powerful shift between text, song and movement that relayed the women’s presence, whether they were centre stage physically – which they all took that space at least once within the work – or in the shadows behind the real and metaphorical safety of the desk. The audience’s experience was clearly one of being moved too – a mix of celebrating the women’s resilience and taking to heart the trauma involved in their lives. A standing ovation at the end meant the world to the women – they felt heard and accepted. What do you think are the therapeutic values of using dance to rehabilitate and recover from trauma? For me, the role of safe touch in dance is key to working with trauma-based narratives, I believe, as we are working with anxieties, intimacy and boundaries. I noticed within the women within this particular performance, their whole physicality changed, their posture, their relationships with their own bodies -all of which were holding the scars of physical abuse and substance misuse. Some of the women entered the process not wanting to be touched at all. I work with partner work to develop trust and awareness. Physical ‘body shock’ can be retriggered through touch if it is not safe and considered so we were extremely gentle and careful in our practice to be aware of physically re-triggering of old events whilst simultaneously opening up a space for healing with those who have experienced abuse or trauma to the body. The approach is compassionate and empathic but also clear about what can be gained from modelling new approaches to touch – re-programming the body to trust another human being, to find joy in moving with someone else – giving and taking weight – sharing something together and expressing through the body as well as through text. Do you think art in its various forms can have a place in the justice system, i.e. through teaching law to law students, the young, those dealing with the justice system as offenders or victims? Dance is a practice and theory of form, where the real can meet the metaphorical. My job is to try to find meaning in movement. If this can be extended to other arenas, other institutions such as the legal, as a policy or method, then this is what VDT would ultimately support and envision through the work we do. Having worked in the with highest security prisons and in hospitals, creativity can be and can give, a reason to live more fully, an opportunity to speak of things that are difficult to say, things that have meaning and are important in peoples’ lives without judgement or recompense. It offers people the space and chance to reflect on aspects of their lives and process that reflection to become more aware – watershed moments, of what certain things and events has really meant to them. Creativity offers a way of moving forward, an act of translation, a way of being heard. And that – particularly for vulnerable women who are often misunderstood or shamed because of how their lives have panned out – is of infinite benefit to all of us. Makers such as Charlotte and her theatre are at the vanguard of politically informed practice that seeks to foster positive legacies in the lives of those concerned before and beyond the stage on which their stories are acted out as ‘art’. These are not just glib attempts at creative-social engagement but a solid example of how those who have committed their lives as artists and makers, can foster new ways of being in the world that exceed the art markets of their various guises, the galleries, the online stores, the theatre venues. Whether VDT can measure its impact and change laws at a Parliamentary level is another thing to be seen, but its setting the example of bringing serious social and political change, at whatever scale, through art, is invaluable to the future of social justice, and an inimitable example of what art/law can and could achieve.